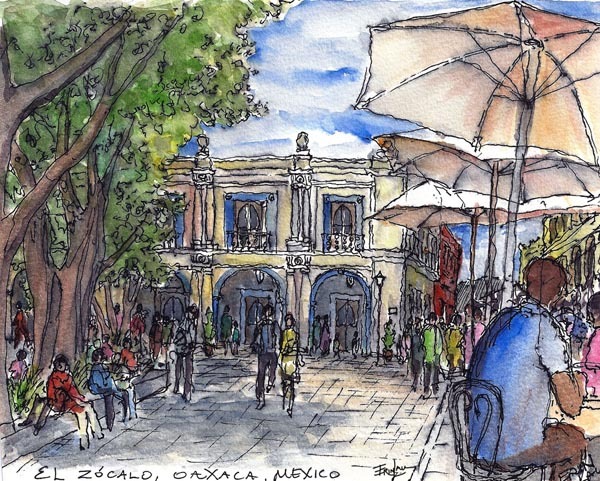 The Zócalo, or main plaza, in Oaxaca was peaceful and social in the days after the national Gubernatorial election of June 2010.The place was completely cleared of protesters and only a few stalls remained. It was back to the social life of lazy afternoons. They completely re-planted everything except the trees within two days, so it was an utter transformation. I wish I had also been able to sketch the protestors and their encampments, but I never got the chance.